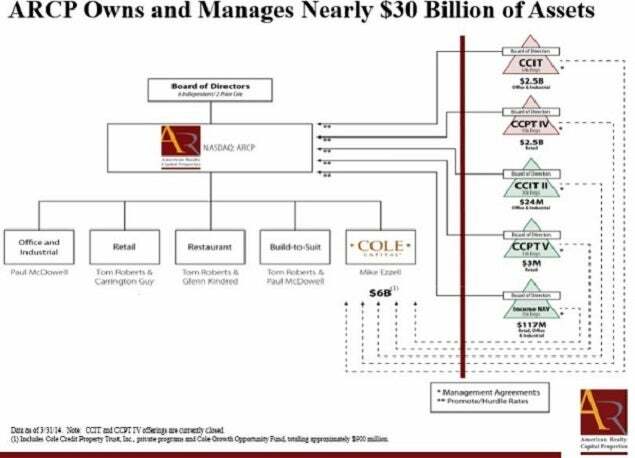 Huge ARCP Deal With Select Income REIT: The latest blockbuster deal announced by single-tenant net-lease giant $12 billion American Realty Capital Properties (NASDAQ: ARCP) this year is an ~$3 billion sale of the entire Cole Corporate Income Trust, Inc., or CCIT, portfolio to $1.67 billion Select Income REIT (NYSE: SIR). This is to be accomplished through a merger agreement requiring the approvals of both CCIT shareholders and REIT Management & Research, or RMR, managed Select Income REIT. 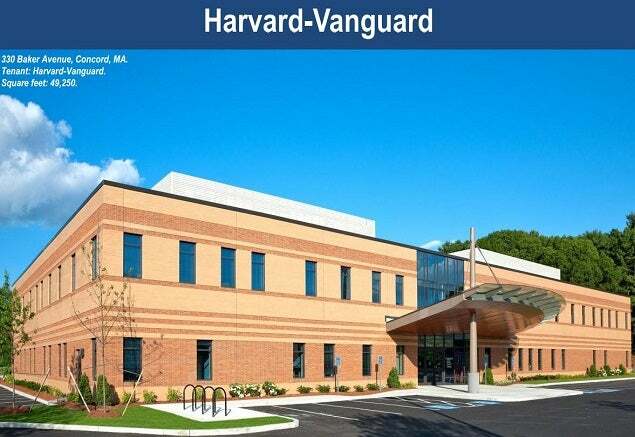 This CCIT portfolio has been managed by Cole Capital, ARCP's includes: 64 office and industrial properties, as well as 23 healthcare assets containing an aggregate square footage of ~18.3 million SF. The portfolio is 100 percent-leased with a weighted average remaining lease term of 11.4 years. “The announced merger of CCIT with Select Income REIT demonstrates ARCP's ability through Cole Capital to raise capital, invest in high-credit-quality assets and harvest value for the stockholders of its managed non-listed REITs through a transaction with an unaffiliated third party that values the total enterprise at approximately $3.1 billion,” said David S. Kay, president of ARCP. 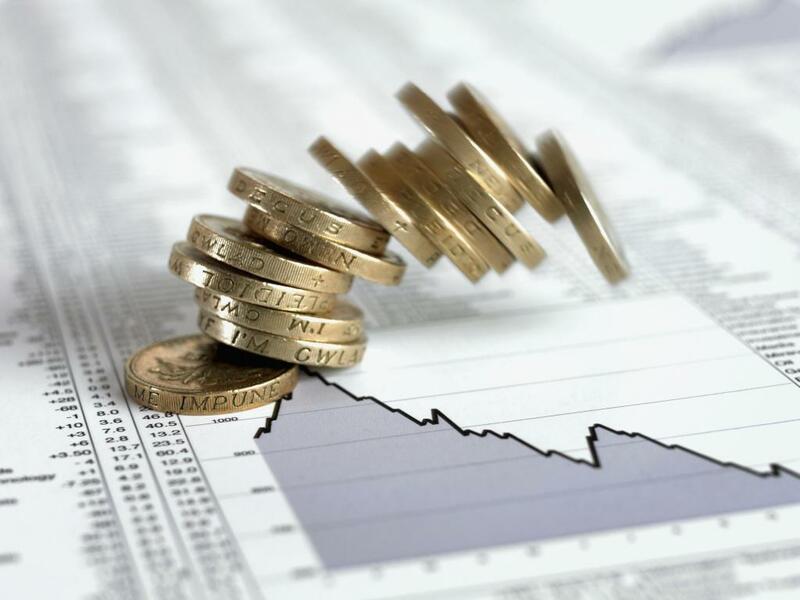 Select Income shares were down around five percent in mid-day trading, and ARCP shares were up just under one percent on the news. In conjunction with the proposed merger agreement with CCIT, Select Income REIT external manager RMR also announced the planned sale of the 23 medical office building, or MOB assets, (to be acquired in the CCIT deal above), to $4.75 billion Senior Housing Properties (NYSE: SNH) an RMR externally-managed healthcare REIT for ~$539 million. The 23 properties contain approximately 2.2 million square feet and are located in 12 states. The properties are currently 100 percent leased for a weighted average term of 9.5 years -- with no scheduled lease expiration before December 31, 2018. 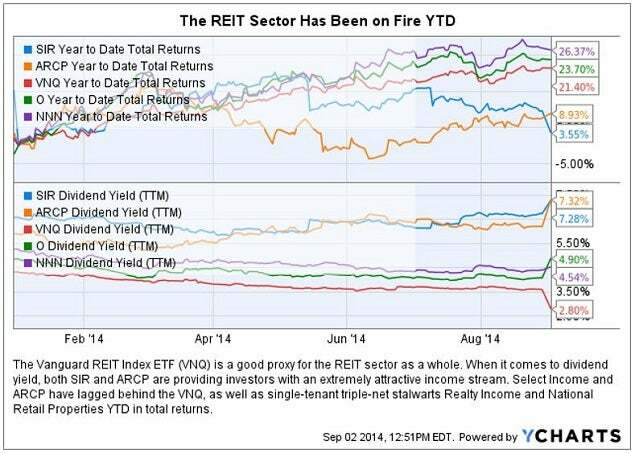 Related Link: 3 Small-Cap REITs Yielding More Than 7% - Flying Under The Radar? Approximately 72 percent of these tenants have an investment grade rating. 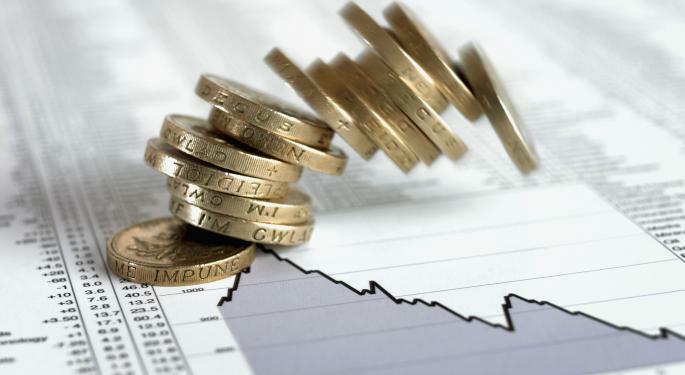 This acquisition would serve both to diversify and improve the overall credit quality of the SNH portfolio. 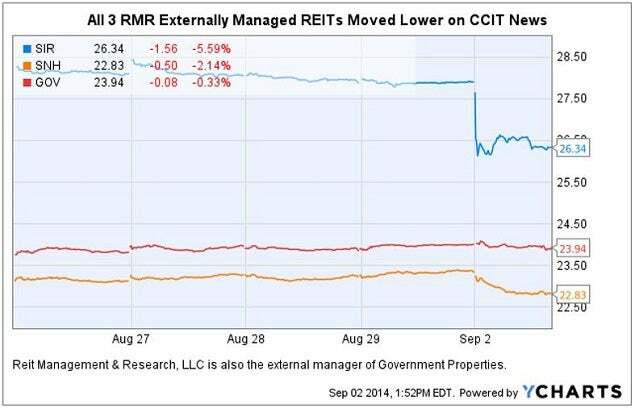 Government Properties, along with its external manager RMR, owns ~36.8 percent of Select Income REIT outstanding common shares as of September 2, 2014, according to an SEC filing by the company. STAG Industrial continues its practice of announcing monthly updates on acquisitions and leasing in a timely fashion, immediately after the end of the preceding month. On September 2, 2014 STAG announced having acquired three warehouse and distribution buildings containing a total of 414,585 square feet for approximately $13.6 million during the month of August 2014. The buildings are located in the greater Charlotte and Asheville, North Carolina markets. The buildings are 100 percent leased with a weighted average lease term remaining of five years. For the year to date, the Company has acquired 17 industrial buildings consisting of approximately 3.8 million square feet for approximately $142 million. 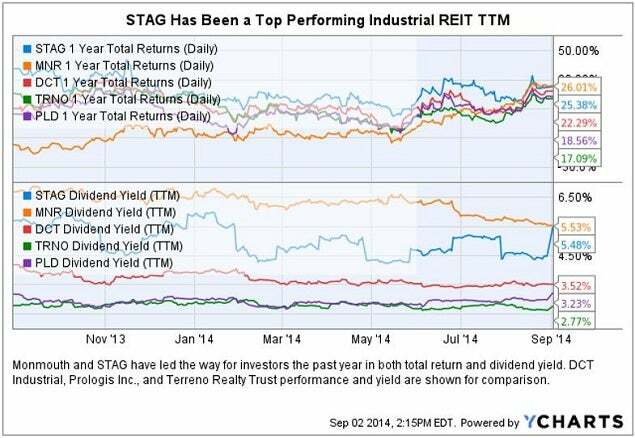 STAG Industrial sports a market cap of $1.3 billion and pays a monthly dividend currently yielding investors an uncompounded return of ~5.5 percent.